Sister Mary Bonaventure Gowan, R.S.M. Sister Mary Bonaventure Gowan, R.S.M., died March 26 at McAuley Convent, Merion. She was 86. Born and raised in Doylestown, she graduated from Fitzgerald Mercy Hospital School of Nursing. After working for several years, she entered the Sisters of Mercy in 1955 and professed her vows in 1957. 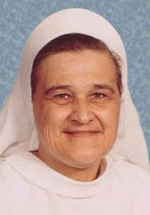 Sister Bonaventure was a nurse and supervisor at Misericordia Hospital (now Mercy Philadelphia Hospital) and Mercy Hospital in Sea Isle City, N.J. In 1964 she began a 12-year ministry at Mercy Hospital in Jamshedpur, India, meeting the many needs of the hospital patients and those living in surrounding villages. Each Friday she or another nurse would accompany Sister Mary Liguori, a surgeon, to Jamshedpur’s leper encampment to treat patients. On another weekday she would treat residents of surrounding villages in mobile clinics. During her time in Jamshedpur the region experienced a severe famine. Sister Bonaventure was responsible for arranging a feeding system to serve one meal each day for 300 people. Despite her limited facility with the Hindi language, she would oversee teams to cook bulgur wheat dishes. In 1976 Sister Bonaventure returned to Merion to coordinate the care for elderly and infirm Sisters of Mercy. She was the initial director of McAuley Convent when it opened in 1979 and spent 33 years there. Her responsibilities expanded to include director of nursing and coordinator of health services at McAuley. She developed remarkable diagnostic skills and often engaged with doctors discussing the sisters’ conditions and meeting their needs. Clothed in her white habit and veil, she could be found at the nurses’ station at McAuley any hour of the day and many into the night. In spring and summer, she tended her flower gardens or to watched a Phillies game. She retired to McAuley Convent in 2015 where she enjoyed reading, television and word puzzles. Friends and associates are invited to her viewing on Monday, April 1 at 6 p.m. followed by her funeral Mass at 7 p.m. in the Chapel at the Convent of Mercy, 515 Montgomery Ave., Merion Station. Burial will be on Tuesday, April 2, at 10 a.m. in the Community Cemetery. Contributions in Sister Bonaventure’s memory made be made to the Sisters of Mercy Mid-Atlantic Community at the above address.